The iconic status achieved overnight by Brett Murray’s painting The Spear is a measure of the quality of the work, now deplorably destroyed by iconoclasts. President Zuma and the ANC took no action when a directly comparable depiction by Ayanda Mabulu – also portraying the exposed private parts of both President Zuma and Archbishop Emeritus Desmond Tutu – was exhibited in Cape Town. 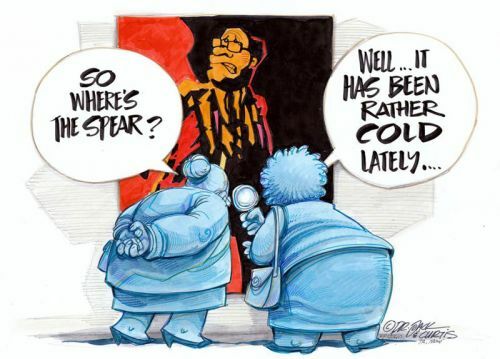 The difference was that The Spear was brilliant as a work of political satire, which is also why it became an instant icon. South Africa has been descending for some time into a censorious mind-set that is taking us further and further away from the free speech which is fundamental to our democracy. If the President feels that his dignity has been impugned, he should sue Murray for damages as he is suing the cartoonist Zapiro. Applying to court to have an exhibition shut down on these grounds is unjustifiable censorship. It is furthermore pathetic that a little posse from the Film and Publications Board was lurking around the Goodman Gallery on Monday with a view to “classifying” the work. On which provision of the Film and Publication Act were they relying? Sexual conduct? Discrimination? They owe us an answer and they will find that there is none. The 2009 Film and Publications Board Amendment Act was one of the signposts in our descent into censorship. It reversed the fine free speech-oriented 1996 Act. President Zuma, the ANC and the iconoclasts will find that powerful art cannot be censored or erased from public memory. The Spear will now live on forever instead of being banned in perpetuity as the President wanted.